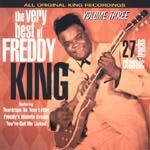 Freddy King is a blues player who's material found its way into surf sets in early days of reverb and drums. Tunes like "San-Ho-Zay" and "Hideaway" were commonly covered by surfbands. This CD includes 11 instros, virtually all in a more blues vein. "Freddy's Midnite Dream" is a downright surfable instro worth checking out. A "Shortnin' Bread" piano rhythm sets up the blues jam. Obviously groovin', but not terrible memorable.